Robertson, Raleigh J.. "Oriole". The Canadian Encyclopedia, 04 March 2015, Historica Canada. https://www.thecanadianencyclopedia.ca/en/article/oriole. Accessed 22 April 2019. 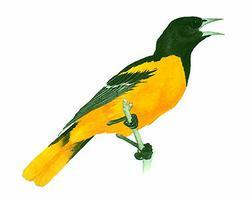 Oriole is the common name for members of 2 families of birds. The Old World family Oriolidae occurs from Europe through Africa and Asia to Australia. There are 2 species of northern oriole: Bullock's (western population) and Baltimore (eastern) (Macmillan Illustrated Animal Encyclopedia). Oriole is the common name for members of 2 families of birds. The Old World family Oriolidae occurs from Europe through Africa and Asia to Australia. In the Western Hemisphere, the name refers to brightly coloured, black and yellow or orange birds of the family Icteridae. Some 30 species of these melodious songbirds are known, with greatest diversity found in Mexico and Central America. In most species males are larger and more brightly coloured than females. Yearling males often resemble females, perhaps reducing predation or aggression from older males. Orioles consume insects and small fruits. Three species breed in Canada. 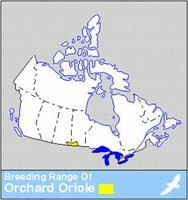 The orchard oriole (Icterus) breeds locally in southern Ontario and recently in Manitoba. Baltimore orioles (I. galbula), common throughout southern Canada east of Alberta, breed in scattered trees and open woodland. Bullock's oriole (I. bullockii) arrives in summer to southern BC and Alberta. Bullock's and Baltimore orioles were considered subspecies of the northern oriole but have been re-evaluated as separate species. Orioles winter from southern Mexico to Colombia and Venezuela. The female lays and incubates 4-5 greyish white eggs marked with brown or black scrawls. Baltimore and Bullock's orioles weave pendulous nests of plant fibres and hair. The orchard oriole builds a similarly shaped but smaller nest of woven grasses.